Title: Investing in the Gold Market: Market Timing or Buy-and-Hold? While the literature on gold is dominated by studies on its diversification, hedging, and safe haven properties, the question “When to invest in gold?” is generally not analyzed in much detail. We test more than 4,000 seasonal, technical, and fundamental timing strategies for gold. While we find large gains in economic terms relative to the buy-and-hold benchmark for several strategies, the results are robust to data-snooping biases only for selected technical trading strategies. These superior technical trading strategies outperform the buy-and-hold benchmark because they shift out of the gold market following a prolonged trend of negative gold market returns. We verify that the outperformance is not driven by a systematic reaction to the broader market environment and conclude that our results point to the presence of behavioral biases inducing gold market trends. "The question when to invest in gold has received remarkably little attention, while most research focuses on the diversification, hedging, and safe haven properties of gold. This study aims to close this gap by analyzing if an active investor can beat a passive buy-and-hold strategy by timing the gold market. For our evaluation period from January 1990 to December 2015, our back-test results for more than 4,000 different seasonal, technical, and fundamental trading strategies reveal that significant excess returns were possible. To construct a comprehensive collection of market timing strategies, we build either on the economic properties of gold or incorporate the findings regarding previously surveyed anomalies in gold prices. In this section, we describe the strategies, rules, and variables used to predict gold returns. Baur (2013) provides evidence for monthly seasonality in the gold market, with positive and statistically significant gold returns limited to the months September and November. Similar results are shown by Qi and Wang (2013) for the Chinese gold market and Naylor, Wongchoti, and Ith (2015) for U.S. gold ETF returns. To exploit this monthly anomaly, an investor could follow a simple strategy that invests in gold in September and November and reverts to holding cash in the remaining months. Although this strategy is supported by economic intuition, e.g., by the increased wedding season gold jewelry demand in India, the strategy itself is merely mechanic. Therefore, to address the concern that this strategy has simply been ‘mined’ from the data, we follow Dichtl and Drobetz (2014) and implement a more comprehensive approach: Each month, an investor can either be invested 100% in the gold market, or 100% in cash. In this vein, we obtain 212 = 4,096 different monthly seasonal allocation strategies, labeled from SEA0 to SEA4095, where SEA stands for seasonal. Moskowitz, Ooi, and Pedersen (2012) find time series momentum in monthly returns of several liquid instruments, including gold futures. Therefore, we include monthly technical trading strategies based on moving average and momentum indicators in our empirical analyses. We invest in the gold market if the short moving average is above the long moving average and revert to holding cash otherwise. The short index for the moving average is set to 𝑠 = 1, 2, 3 and the long index to 𝑙 = 9, 12, which results in six moving average strategies. We also set 𝑠 = 1 and 𝑙 = 10, 24, 36, 48 to cover some other parameterizations that are popular in the literature and among investors. Overall, we employ ten different moving average strategies. We invest in gold if the gold market exhibits positive time series momentum. Otherwise, an allocation is taken in the cash market. Following Moskowitz, Ooi, and Pedersen (2012), we set 𝑚 = 1, 3, 6, 9, 12, 24, 36, 48 months. Building on the economic properties of gold, a lot of researchers identify several fundamental factors that serve as predictors of future gold returns by affecting either the demand and supply of gold or market participants’ expectations thereof. To construct tradeable strategies based on these fundamental factors, we first estimate a simple linear regression model for each predictor variable (11 predictors in total) for forecasts of the spot price of gold. We also exploit the simple mean of all individual forecasts (𝑀𝐸𝐴𝑁) as another potential market timing strategy. We also consider a “kitchen sink” forecast (𝐾𝑆𝐹), which incorporates all available predictor variables simultaneously in a multivariate regression model. We measure the performance of our market timing strategies in terms of mean absolute returns and mean risk-adjusted excess returns, or Sharpe ratios (Sharpe, 1994), over the evaluation period. Table 3 lists the five best market timing strategies for each of the three strategy groups, i.e., seasonal trading strategies, technical trading strategies, and fundamental trading strategies. 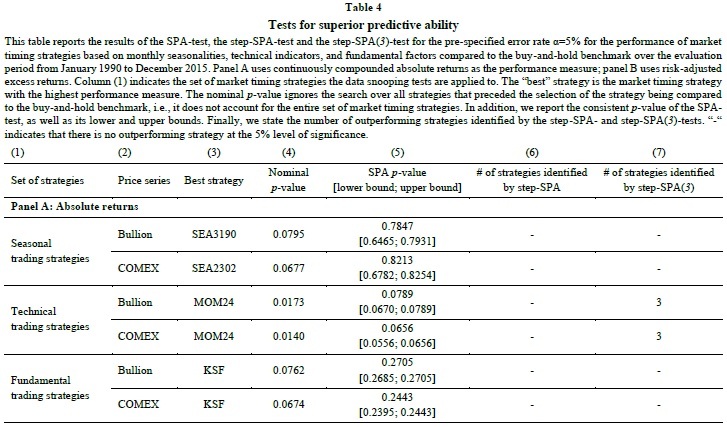 Overall, while the results in Table 3 already provide a first indication which strategies perform well compared to the buy-and-hold strategy, these analyses neither test for statistical significance nor account for the data-snooping problem. However, because all timing strategies are tested on the same data set, the observed outperformance may simply result from chance and not due to any robust relationship. To account for this data snooping bias, we apply a multiple testing framework and find that only a limited number of technical trading strategies show a statistically significant outperformance relative to the buy-and-hold strategy. To assess the statistical significance of performance relative to buy-and-hold, while controlling for data snooping, we use Hansen’s (2005) SPA-test to all three types of strategies. In each test, the strategies are compared with the performance of the buy-and-hold benchmark. Accordingly, the first test considers all 4,095 different monthly seasonal trading strategies,12 the second test all 18 technical trading strategies, and the third test all 15 fundamental trading strategies. The SPA-test results are presented in Table 4. To further examine the characteristics of these superior technical trading strategies, we verify their long-term market timing ability using a conditional market model and preclude that their excess returns are compensation for crash risk, i.e. periods of persistent negative returns. Moreover, we find that the outperformance of these strategies is not driven by different economic and financial regimes. We thus conclude that the superiority of those timing strategies comes from the presence of behavioral biases in the gold market. As pointed out by Hurst, Ooi, and Pedersen (2013), trends emerge if market participants initially underreact to new information, possibly due to anchoring or conservatism. Trend-following strategies, such as time series momentum or moving-average rules, capitalize on the subsequent price changes, since the market price only gradually incorporates the full effect of the news. Once a trend has started, a delayed over-reaction may even exacerbate the trend, e.g., due to herding behavior, feedback trading, or biased self-attribution." The leverage aversion theory implies that returns to the betting-against-beta (BAB) strategy are predictable by past market returns: An outward shift in investors' aggregate demand function simultaneously increases market prices and increases the expected future BAB return. I confirm the prediction empirically and find that the BAB strategy performs better in times when and in countries where past market returns have been high. I construct timing-strategies that are long BAB half the time and short BAB half the time, based on past market returns, and show that these timing strategies have realized strong historical performance. nds that the SML is too flat, and Black (1972) and Frazzini and Pedersen (2014) (FP hereafter) suggest that the at SML is due to leverage constrained investors. Instead of applying leverage, constrained investors obtain an expected return higher than the expected return on the market by over-weighting high-beta stocks and under-weighting low-beta stocks in their portfolios, thereby lowering future risk-adjusted returns on high-beta stocks and increasing future risk-adjusted returns on low-beta stocks. FP construct a betting-against-beta (BAB) portfolio that goes long low-beta assets, leveraged to a beta of one, and short high-beta assets, also leveraged to a beta of one. The leverage aversion theory in FP predicts that the SML should be too flat on average and that the BAB factor should have a positive average return, which FP also find empirically. First, holding expected returns constant, constrained investors become more constrained and increase the over-weight to high-beta stocks, such that the expected return on the BAB factor increases. Second, since prices increase and expected returns decline for markets to clear, the improvement in utility of over-weighting high-beta stocks decline, such that investors become less constrained and the expected BAB return declines. Thus, if investors become more constrained following an outward shift in their demand functions, the shift leads to an increase in the expected BAB return, but if investors become less constrained it leads to a decrease in the expected BAB return. It seems natural that investors become more constrained following an outward shift in their demand functions, and I show that empirically high past market returns forecast high future BAB returns and that daily market returns are negatively correlated with contemporaneous BAB returns. I demonstrate this for both U.S. BAB returns and international BAB returns, as well as for BAB factors formed from country indices. ficant in 12 of the 24 countries. fferences in future BAB returns. Sorting countries based on their past market return shows that future BAB returns are higher in countries for which the past market return was higher than the cross-country average market return, and future BAB returns are lower in countries for which the past market return was below the cross-country average. I also test the predictability of BAB using country indices. Here, the BAB strategy goes long country indices with a low beta to a global index and short indices with a high beta to a global index. 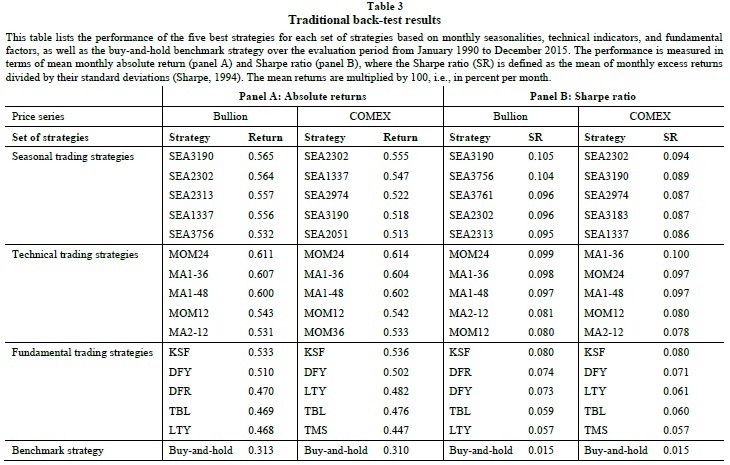 FP show that the BAB strategy generates positive excess returns in a region of 13 developed countries, and extending their results I show that the BAB strategy also generates positive returns in a region of 25 emerging countries. Further, I show that in each region the returns on the BAB strategy are predictable by past returns on a cap-weighted index of the countries in the region." The Quantpedia site was created seven years ago and, over time, our pet project evolved into something bigger. We started small, but we always wanted to have a wide scope of strategies in our database. Our goal was to find, analyze, describe and categorize as many quant trading strategies as possible. Thus, we did not limit our focus to only one asset class, trading style, or instrument type. I am really excited to introduce our cooperation with QuantConnect. 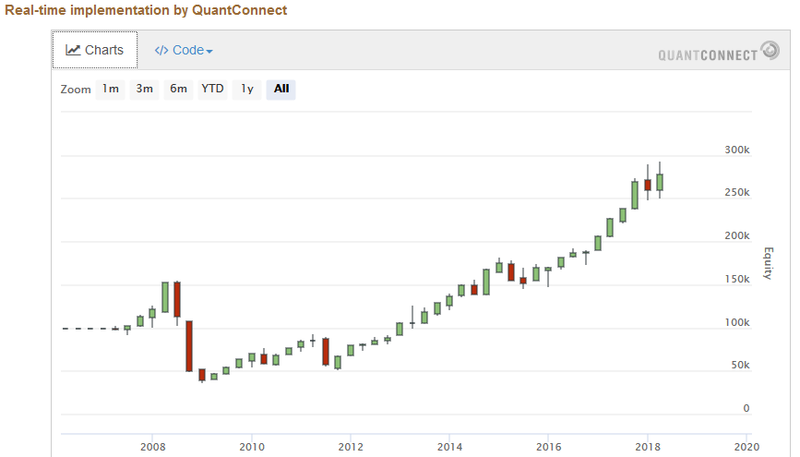 With the company’s resources and extensive database of historical data, combined with a backtesting engine, QuantConnect was able to start systematically backtesting strategies from our database. And now, we can finally start showing you out-of-sample backtests for some of our strategies. If you’re unfamiliar, QuantConnect is a cloud-based algorithmic trading platform that enables its community of more than 60k quants, computer scientists, and engineers to backtest and deploy live strategies to brokerages such as Interactive Brokers and Coinbase Pro. At the moment, QuantConnect has covered nearly 20 strategies and will continue to periodically add new strategy implementations in the future. The QuantConnect out-of-sample backtests can be found at the bottom of Quantpedia strategy's subpage. Let’s look, for example, at strategy #2 - Asset Class Momentum. If you scroll down on that page, after a description of Asset Class Momentum strategy and links to source and related research papers, you’ll see a section with embedded code, an out-of-sample chart, and performance and risk statistics, all from QuantConnect. Title: Is Bitcoin Really Un-Tethered? This paper investigates whether Tether, a digital currency pegged to U.S. dollars, influences Bitcoin and other cryptocurrency prices during the recent boom. Using algorithms to analyze the blockchain data, we find that purchases with Tether are timed following market downturns and result in sizable increases in Bitcoin prices. Less than 1% of hours with such heavy Tether transactions are associated with 50% of the meteoric rise in Bitcoin and 64% of other top cryptocurrencies. The flow clusters below round prices, induces asymmetric auto-correlations in Bitcoin, and suggests incomplete Tether backing before month-ends. These patterns cannot be explained by investor demand proxies but are most consistent with the supply-based hypothesis where Tether is used to provide price support and manipulate cryptocurrency prices. "Our study examines the interaction between the largest cryptocurrency, Bitcoin, other major cryptocurrencies, and Tether, a cryptocurrency that accounts for more transaction volume than U.S. dollars. Tether is a cryptocurrency purportedly backed by U.S. dollar reserves and allows for dollar-like transactions without a banking connection, which many crypto-exchanges have difficulty obtaining or keeping. Although some in the blogosphere and press have expressed skepticism regarding the U.S. dollar reserves backing Tether, the cryptocurrency exchanges have largely rejected such concerns and widely use Tether in transactions. In this paper, to shed light on the driving forces behind the recent boom of cryptocurrency markets, we focus on variants of two main alternative hypotheses for Tether: whether Tether is ’pulled’ (demand-driven), or ’pushed’ (supply-driven). First, if Tether is ’pulled’ or demanded by investors who own fiat currency, the issuance of Tether facilitates the demand of these investors who value the flexibility of a digital currency and yet the stability of the dollar ’peg’. The demand for Tether could also arise because of its practicality for engaging in cross-exchange pricing arbitrage. Alternatively, if Tether is ’pushed’ on market participants, Bitfinex supplies Tether regardless of the demand from investors with fiat currency to purchase Bitcoin and other cryptocurrencies. The acquired Bitcoins can then gradually be converted into dollars. In this setting, the Tether creators have several potential motives. First, if the Tether founders, like most early cryptocurrency adopters and exchanges, are long on Bitcoin, they have a large incentive to create an artificial demand for Bitcoin and other cryptocurrencies by ’printing’ Tether. Similar to the inflationary effect of printing additional money, this can push cryptocurrency prices up. Second, the coordinated supply of Tether creates an opportunity to manipulate cryptocurrencies. When prices are falling, the Tether creators can convert their Tether into Bitcoin in a way that pushes Bitcoin up and then sell some Bitcoin back into dollars to replenish Tether reserves as Bitcoin price rises. Finally, if cryptocurrency prices crash, Tether creators essentially have a put option to default on redeeming Tether, or to potentially experience a ’hack’ where Tether or related dollars disappear. Both the ’pushed’ and ’pulled’ alternatives have different testable implications for flows and cryptocurrency returns that we can take to the powerful blockchain data. We begin our exercise by collecting and analyzing both the Tether and Bitcoin Blockchain data through a series of algorithms we implement to reduce the complexity of analyzing the blockchain. Tether is created, moved to Bitfinex, and then slowly moved out to other crypto-exchanges, mainly Poloniex and Bittrex. Interestingly, almost no Tether returns to the Tether issuer to be redeemed, and the major exchange where Tether can be exchanged for USD, Kraken, accounts for only a small proportion of transactions. We then examine the flow of coins identified above to understand whether Tether is pushed or pulled, and examine the effect of Tether, if any, on Bitcoin prices. First, following periods of negative Bitcoin return, Tether flows to other exchanges are used to purchase Bitcoin. Second, these flows seem to have a strong effect on future Bitcoin prices. They are present only after periods of negative returns and periods following the printing of Tether, that is, when there is likely an oversupply of Tether in the system. A placebo test finds no evidence of Bitcoin price movements following large flows of Bitcoin from Poloniex and Bittrex to major exchanges other than Bitfinex. This phenomenon strongly suggests that the price effect is driven by Tether issuances. To illustrate the potential magnitude and predictive effect of Tether issuances on Bitcoin prices, we focus on the hours with the largest lagged combined Bitcoin and Tether flows on the two blockchains. These 87 hours have large negative returns before the flows but are followed by large return reversals. These 87 events account for less than 1% of our time series (over the period from the beginning of March 2017 to the end of March 2018), yet are associated with 50% of Bitcoin’s compounded return, and 64% of the returns on six other large cryptocurrencies (Dash, Ethereum Classic, Ethereum, Litecoin, Monero, and Zcash). The results are consistent with the Tether issuers pushing out Tether to stabilize the price of Bitcoin, but we investigate these issues further. Investors hoping to stabilize and drive up the price might concentrate on certain price thresholds as an anchor or price floor. This follows the idea that if investors can demonstrate a price floor, then they can induce other traders to purchase. Interestingly, Bitcoin purchases by Bitfinex strongly increase just below multiples of 500. This pattern is only present in periods following printing of Tether and not observed by other exchanges. To address causality, we use the discontinuity in Tether flow at the round threshold cutoffs as an instrument to measure the effect of Tether on Bitcoin prices. The instrumental regression results are even stronger, indicating that Tether flows are causing the positive return. If Tether is pushed out to other crypto exchanges rather than demanded by investors with dollars in hand, Tether may not be fully backed by dollars when issued. However, if the issuers wished to post monthly bank statements to shore up dollar reserves and appear fully backed, this would necessitate the liquidation of the purchased Bitcoins at the end-of-the-month (EOM). Interestingly, we find a significant negative EOM abnormal return of 6% in the months with strong Tether issuance. 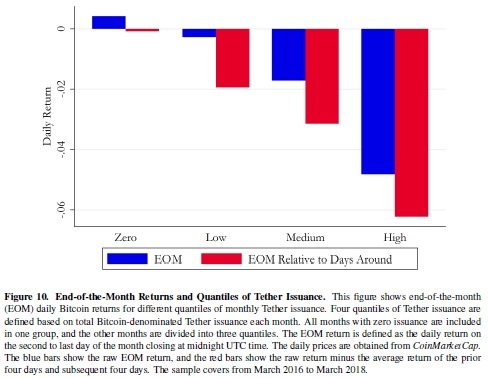 The EOM Bitcoin returns are highly correlated with the magnitude of Tether issuance, and no abnormal returns are observed in months when Tether is not issued. Our results are consistent with Tether being pushed out onto the market and not primarily driven by investors’ demand, but we nevertheless further examine two direct implications of the ’pulled’ hypotheses. In particular, we examine if the flows of Tether bear much relation to a proxy for its demand from investors, the premium for Tether relative to the U.S. Dollar exchange rate. We find little evidence to support this hypothesis. Another related alternative is that the crossexchange arbitrage to eliminate pricing discrepancies across exchanges is the primary driver of the Tether flow, but this hypothesis is not supported by the data. Although we find little support for demand-based proxies, we hypothesize that there are some sources for legitimate demand for Tether, however, those are not the ones that dominate the flow patterns observed in the data. 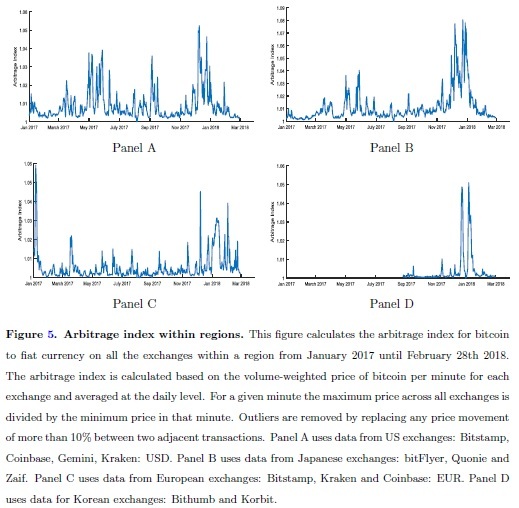 This paper studies the efficiency and price formation of bitcoin and other cryptocurrency markets. First, there are large recurrent arbitrage opportunities in cryptocurrency prices relative to fiat currencies across exchanges that often persist for several days or weeks. These price dispersions exist even in the face of significant trading volumes on many of the exchanges. The total size of arbitrage profits just from December 2017 to February 2018 is above of $1 billion. Second, arbitrage opportunities are much larger across than within the same region; they are particularly large between the US, Japan and Korea, but smaller between the US and Europe. But spreads are much smaller when trading one cryptocurrency against another, suggesting that cross-border controls on fiat currencies play an important role. Finally, we decompose signed volume on each exchange into a common component and an idiosyncratic, exchange-specific one. 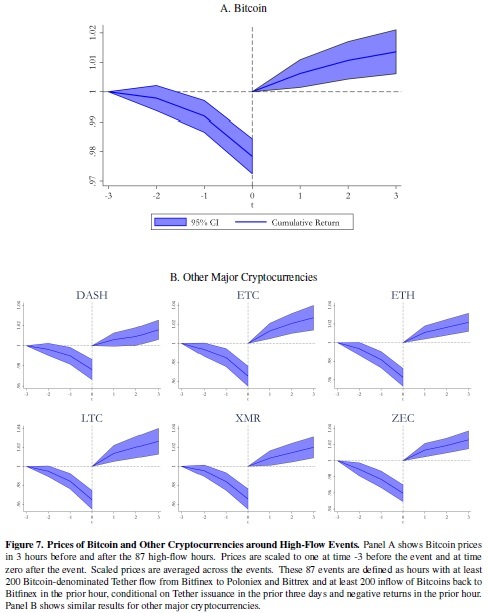 We show that the common component explains up to 85% of the variation in bitcoin returns and that the idiosyncratic components of order flow play an important role in explaining the size of the arbitrage spreads between exchanges. fference in bitcoin prices across exchanges was more than $3000. ts in the period December 2017 - February 2018 is estimated to be at least $1 billion under the most conservative assumptions. fference between Japan and the US was around 10 percent, and between US and Europe about 3 percent. The results suggest that regions which are more closely integrated show smaller cross-region arbitrage spreads. Note, however, that even the within country arbitrage spreads are still large by comparison with more traditional asset markets. For example, Du, Tepper, and Verdelhan (2016) show that deviations from the covered interest rate parity in the currency market after the 2008 financial crisis range between 9 and 23 basis points on average on annualized values. These are an order of magnitude smaller than the ones observed in cryptocurrency markets. cant barriers to arbitrage between regions and to a lesser extent even between exchanges in the same country. We show that mere transaction costs cannot explain these results since their magnitudes are small in comparison to the arbitrage spreads we document. The governance risk of cryptocurrency exchanges is also unlikely to explain these arbitrage spreads. First, the exchange risk would have to be correlated within a region to explain the large crossborder arbitrages we observe. Second, one would expect that the exchange risk would be correlated with trading volume and bid-ask spreads. 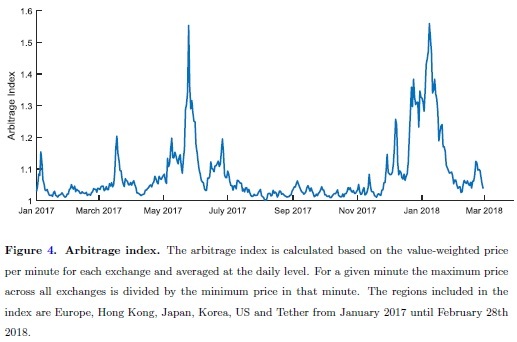 This is not supported by the data, since we find large heterogeneity in the liquidity of exchanges within a region but nevertheless arbitrage spreads are small between them. nding suggest that controls on at currency contribute to the large arbitrage spreads we find across regions. We use factor analysis to extract the common factors from data at 5-minute, hourly, and daily frequencies. The common component of signed volume explains about 50% of the variation in returns at 5-minute and hour level, and up 85% at daily level. The price pressure at the daily level is mostly permanent. Buying 10,000 bitcoins raises returns by about 4%. orts of arbitrageurs to equilibrate prices across exchanges.